The theme this week on the Great British Bake off was Batter, a new theme which some have found quite controversial – is it really baking?! And you can’t possibly have missed the other news that the show will be going over to Channel 4 and no longer be presented by Mel and Sue – sad news as I think it will become commercialised, and won’t be the same GBBO we all love anymore. We’ll have to wait and see I guess. For Batter Week, the bakers had to make signature savoury filled Yorkshire puddings, lace heart-shaped pancakes for the technical, and churros for the showstopper. I thought Benjamina did really well to win Star Baker. I was a bit sad to see Kate leave though as I liked her, and her previous bakes. 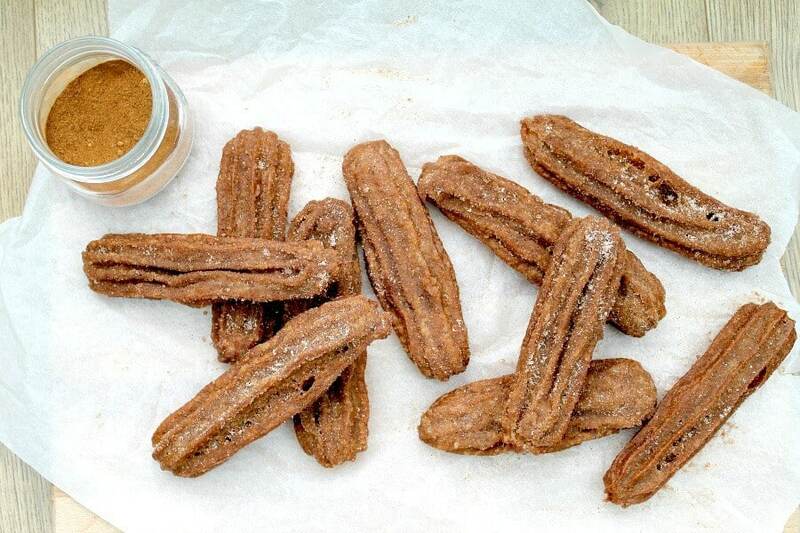 My bake for Batter Week is pumpkin spice churros. I love pumpkin spice lattes and pumpkin spice in baking (for example in my slow cooker spiced pumpkin cake). 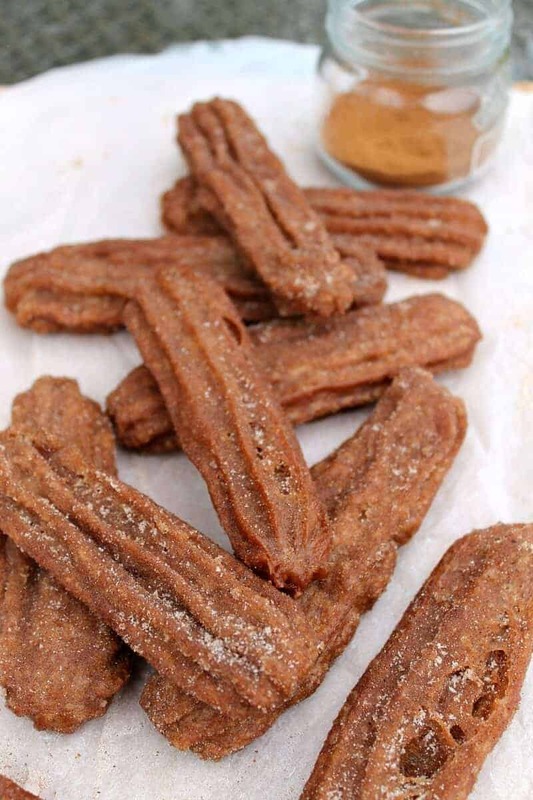 Pumpkin spice churros aren’t a new idea of course, there are loads of them on Pinterest, along with pumpkin spice in almost every recipe you can think of. I need to try making pumpkin spice granola next I think. Or maybe pumpkin spice brownies…. The churro batter has pumpkin spice mix added to it to add extra flavour. This means it is light brown when you pipe out the batter, and it has a deeper colour than plain churros after baking. The sugar also has pumpkin spice mix in place of just cinnamon. I decided that there were more than enough calories in the deep-fried pumpkin spice churros with sugar themselves without adding chocolate dipping sauce so I served mine as they were! I found the churro batter easy to make, it required a lot of strenuous stirring with a wooden spoon but nothing out of the ordinary really, and very like making choux pastry. I now have a small jar of pumpkin spice to use in lattes and baking for the next few weeks too. It is so easy to make, make sure you try it, I bet you will have all the spices you need in your cupboards. After deep-frying, which I did in a wok with about an inch of vegetable oil, and used my Thermapen to check the oil had reached the right temperature, the churros were crispy on the outside, with sweetness from the pumpkin spice sugar sprinkled on top, and soft and fluffy in the centre. They look almost caramelised from the extra colour added by the pumpkin spice sugar too – yum! We all loved them and they didn’t last long unsurprisingly. While they took quite a while to make, I would make them again for a special occasion as the results are so good. 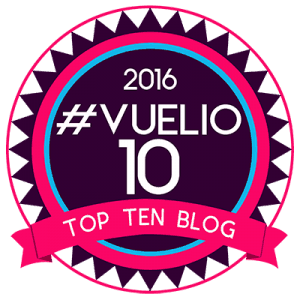 Linking up with the Great Bloggers Bake Off! Mix the tablespoon of pumpkin pie spice, all the flour and salt in a large bowl. Put the butter and boiling water in a saucepan and heat on a low heat until it starts to simmer and then boil. Remove the pan from the heat and quickly add the flour mixture and stir vigorously with a wooden spoon until there are no lumps and you have a smooth thick dough. Leave it to cool for 5 minutes, then add the eggs one by one, mixing well between each addition until the egg is properly incorporated. Leave the batter to rest for 15 minutes. You can start to heat your oil slowly during this time, in a deep-fat fryer or in a deep wok. Pipe the batter onto baking paper using a large star tip. Use a knife to cut off the lengths. Check your oil is at temperature before starting to fry. 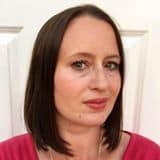 If you are a bit scared of deep-fat frying, as I was, you can reach this brilliant post by Becca from Amuse Your Bouche about deep-frying at home as a guide before you start. Deep-fry a couple of churros as a time for a couple of minutes on each side, then drain them on kitchen roll before rolling in the pumpkin spice sugar. Churro recipe adapted from BBC Good Food. Pumpkin spice recipe adapted from The Pioneer Woman. Oh my, these look amazing! Going to have to make some of this pumpkin spice mix I think, I do have everything! Thank you Helen! I daren’t make them again to stop me from eating them all! Yummy!! That looks and sounds really good!! have to try that someday soon! 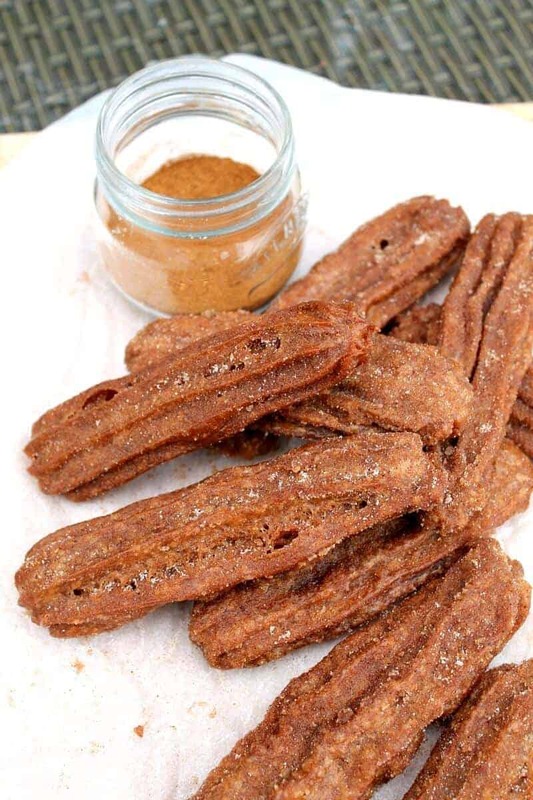 What wonderful looking churros! I love the idea of them having pumpkin in them! Thanks Sarah! No pumpkin this time as I didn’t know what would happen to the consistency, but must try that one day. just the pumpkin pie spice mix this time. these look great & I bet they tasted amazing! I love pumpkin spice & used to have a very small pot of Mccormicks pumpkin pie spice that I bought in America. I’m definitely going to use your recipe to make some more as I do love using it around Christmas. Thanks Helen! I must not make them too often! Bet these taste amazing. I wasn’t brave enough to add anything to the churros mixture itself. Thanks Jacqui, i found the whole process rather scary with the deep frying! 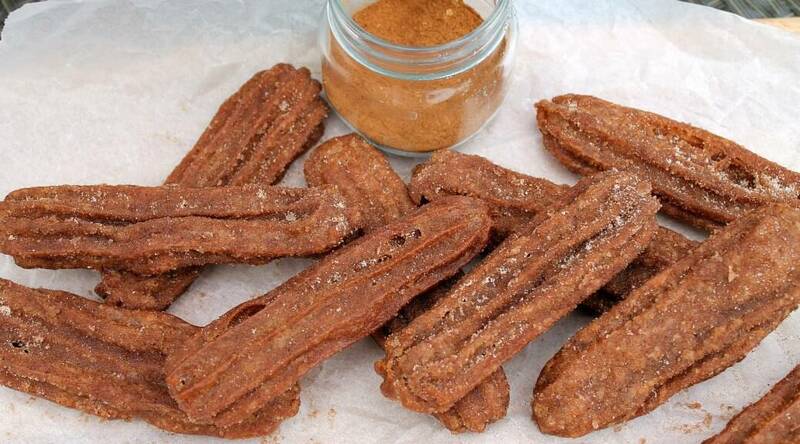 Love the sound of the pumpkin spice in these Churros Lucy, yum! They look amazing Lucy. I’m going to try the oven baked ones at some point. Definitely less scary! I must get over the fear of my gas hob and deep frying. These looks so lovely. 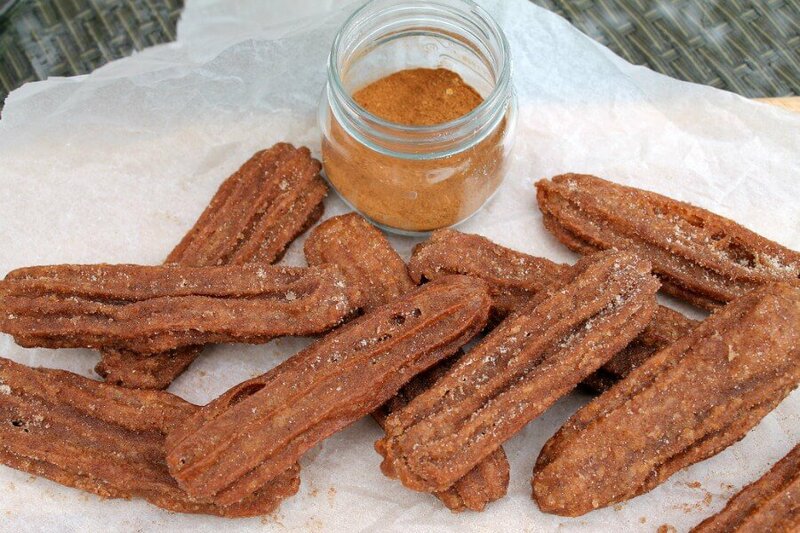 I’ve never tried making churros before but they sound remarkably simple to do. In fact, I’ve only ever eaten them once before – at the food stalls at FBC last year!! Thank you Cathy! In the US you can get pumpkin spice in practically everything at this time of year I think!